Doctor, Nurse, Medical Tech, Optician, Optometrist or Opthamologist, Anatomy and Body Parts Collectors will want to keep their eye on these! Detailed dimensional, high quality acrylic plastic Human Body Part gag gift. 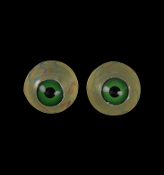 These eyeballs are great for Halloween decorating around the house or you can bring life to a skeleton, skull or prop with these new GREEN eyeballs with murky clear base, including blood vessels and veins for realism. Set of 2 eyeballs, each approx one-inch (25mm) diameter, hazy clear with a half-inch (13mm) Green Iris.